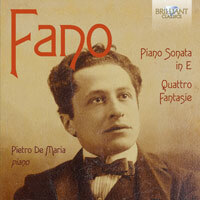 GUIDO ALBERTO FANO (1875-1961): Piano Sonata in E, 4 Fantasie. Description: Aside from Martucci’s, there are very few Italian late Romantic piano sonatas, making this 35-minute, four-movement work from the young Fano (written during 1895-99) not only a fine example of the composer’s early talent but also an important addition to the genre in Italy. The four Fantasie of 1896 are closer to the drawing room with echoes of Schumann and Brahms. Pietro De Maria (piano).